Guess what? I got my camera back. Woot! The camera body and both of my lenses had issues. (Not my fault.) Craziness. Now that I have it back I’m able to get down to business. Blogging without a functioning camera is very limiting, as you can imagine. Although, I’m very proud of my iPhone 4s for standing in for this post and this post. Anyway, I recently springified the card catalog. I used some things from around the house, and I bought a few new things. I used the canvas of us k-i-s-s-i-n-g in some trees since, well, there are trees in the photo, and trees are green and springlike. Although this engagement photo was taken in the fall, but you can’t tell. The books were Christmas gifts– great coffee table books, by the way. I scored the coral from Kohls for $10. The agate slice under the coral is from a rock and gem show in Arizona. You may have seen the photo I posted on Instagram of my treasures. My middleman, Caitlin, from Desert Domicile was my agate slice scout. I put those little cabinet bumper things on the bottom of this slice so it wouldn’t mark up the book. Sidebar: Didn’t Caitlin pick out the most gorgeous agate slices for me? More on what I do with the rest of them later. 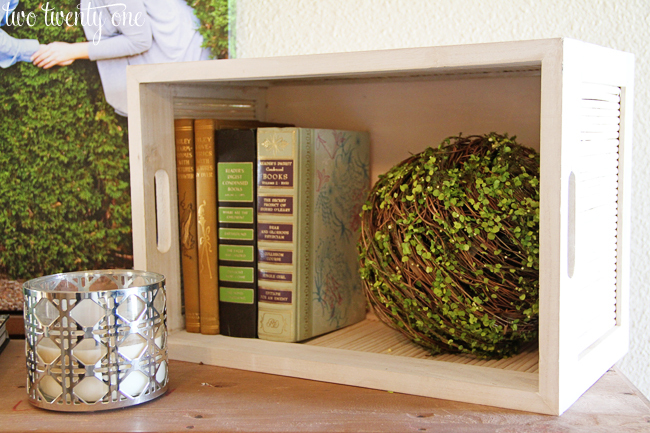 I picked up the wooden crate and greenery ball thing at Home Goods with a Christmas gift card. I already had the books and candle holder. In case you’re wondering, which you probably aren’t, the candle is Coco Loco from Bath & Body Works. If you know me, you know I have an obsession with coconut scented candles, reed diffusers, car fresheners… basically anything that smells like coconut. I didn’t get an up-close photo of the blanket basket, but I used the same quilt and knit blanket I always keep in the wire basket below the card catalog. The thing I love about the multicolored quilt is that I can fold it so seasonal colors are showing. For Christmas, I folded it so red and green colors were showing. I’m pretty sure my great-grandma had this in mind when she made it decades ago. Have you been springifying your home? 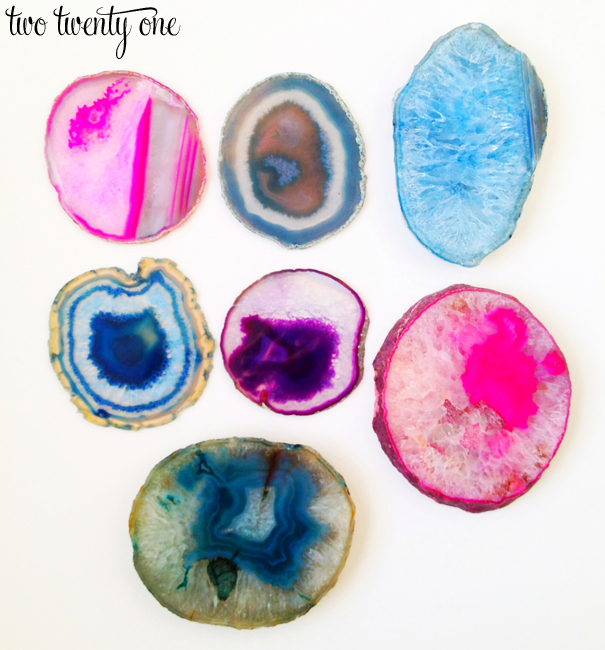 Do you have agate slices mixed into your decor? Who loves coconut scented things as much as me? 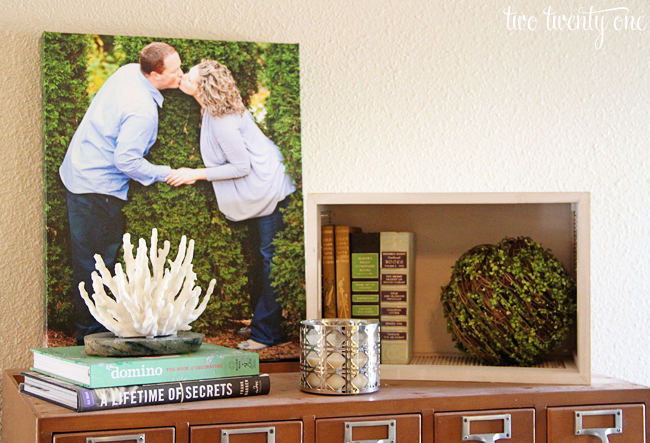 love spring decorating! great job! I do! I love coconut scented things! Lotions, shampoos and conditioners, underarm deodorants, lip gloss… the list could go on! I like those agate slices! Loads of color in those little things! And I am happy you have your camera back, just don’t make him (or is it a her?) work too much that he/she is totally exhausted! I too love a good coconut smell…yum! I love the coconut smell. It reminds me of Hawaiian Tropic, which reminds me of be by the pool and beach. I love that card catalog too! 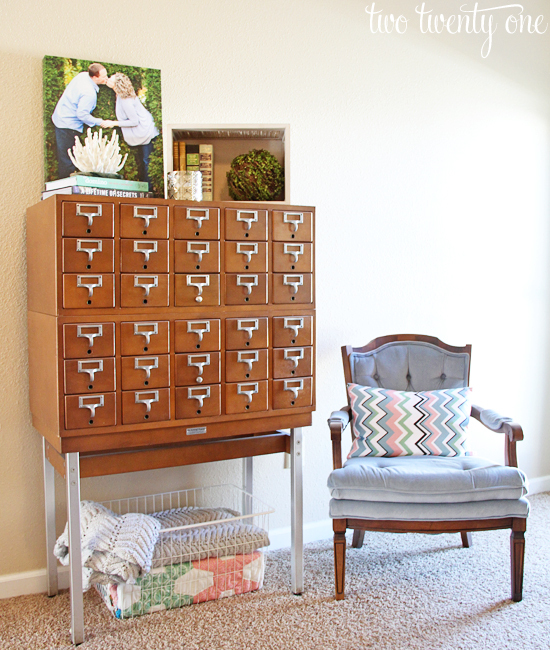 I so covet your card catalog and have been on the search for one near me for months. Thanks for posting another pic of it and happy you are reunited with your camera! I love how you turned the crate to make better use of it! Those agate slices are gorgeous! Can’t wait to see what you do with them! That looks great! You’re awesome at little vignettes like this–I am really, really terrible, which you will see for yourself when you visit my house. I think it’s partly because I don’t own any cutesy little things like the coral/round leafy thing/etc, and can never figure out what looks good and is worth spending on. So pretty much all surfaces of my home are empty. Ha! Makes it a whole lot easier to keep clean! Cute stuff Chelsea! I have never seen those agate slices in stores before and now I like them! I totally laughed at you telling us the candle scent, sounds like something I would do! My obsessive scent for all things smelly is cranberry! I must have candles and plug ins that smell like cranberry – it’s my favorite! Seriously love this! The photo of you guys is adorable and I totally want some of those rocks!! C’mon, share with me please? You and your hubby are just the cutest ever!! And those agate slices are stunning. Have a wonderful weekend, Chelsea! I really love the trees picture. You two are adorable. This looks really nice and I’d very much appreciate you coming over to my house and make these vignettes you speak of. I don’t know what I’m doing. So pretty! 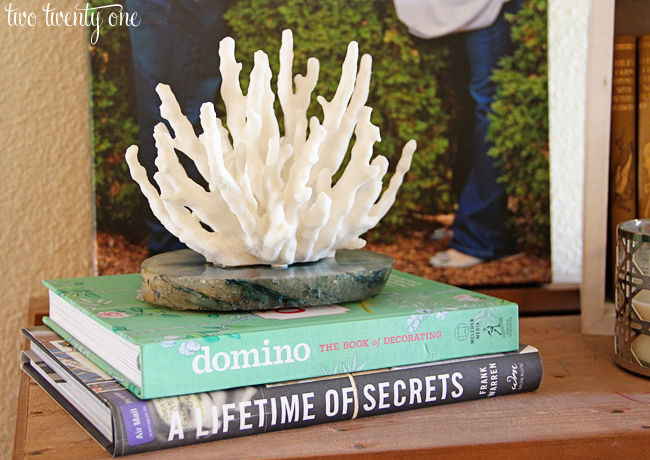 I won caitlin’s giveaway for the agate bookends, and I keep moving them from room to room because I like them EVERYWHERE. She’s such a good hook-up! Loving the card catalog. And the wooden crate on its side has so many possibilities for all the seasons and holidays. Visiting from Merry Monday. I love that card catalog. I want one so bad! Thanks for sharing at Work it Wednesday!